As 2016 draws to a close, it's a toss up as to what the defining theme of the year has been. Is it the ubiquity of IPA, the ongoing rise of sour beer styles, the rate at which the number of new brewing companies is outstripping demand, or the race to get a beer (or beers) into cans for summer? We probably need time away from writing about the local beer scene, ideally in a flotation tank, to come to a conclusion, but what we do know is that Hop Nation has added to the world of IPA in fine style with The Chop while Sam and Dunc's Footscray warehouse home is a welcome addition to Melbourne's collection of brewery venues too. And now they're entering the realm of sour beer styles (while offering take home CANimals at their venue too, of course). 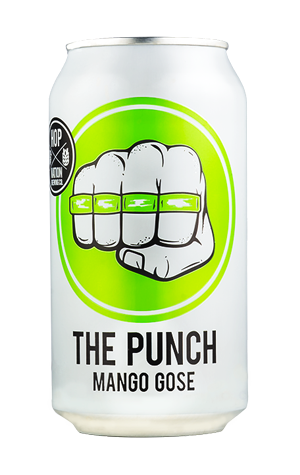 The Punch is a mango gose – the German salty-sour style we wrote about here – they describe as "incredibly refreshing, mouth-watering and a little out there". There's some Murray River pink salt as well as mango and passionfruit pulp in the mix too. The result is a beer so fruity that at first whiff you could be forgiven for thinking you've got a breakfast juice in your hands. It makes the lean, refreshingly acidic and lightly salty mouthfeel quite the surprise, with the combo proving so popular the beer has become Hop Nation's first canned release.